Asaf breaks down opportunities for institutional investors in blockchain. 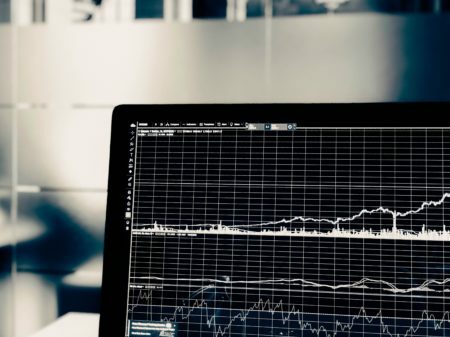 In this post and in the following ones we will examine and define the types of investments and investment vehicles that an institutional investor would consider, in order to partake in the emerging crypto markets. But first, let’s start with the drivers to these conflicting points. The crypto markets which boomed in 2017 have been in a downward spiral since the beginning of 2018. There are multiple reports about ICO scams and price manipulation , highlighting the lack of liquidity across most of exchanges and crypto coins, as well as the lack of regulatory controls. The main issue impacting the markets however, is that there is no match between the financial perceived value and the real utility value of these crypto coins. Placeholder, one of the early blockchain funds, summarizes this point nicely in their thesis paper, and Chris Burniske stated it lately in this tweet-storm — in his words “financial reality divorced from utility fundamentals in 2017”. Most notably the usage, or lack of, dapps (decentralized applications run over blockchain) is evident as at its peak in mid-May this year there were just over 30,000 daily active users across all available dapps. For comparison Facebook has roughly 1.5 billion daily active users. This is 50,000 times more than all dapps together. Blockchain is a breakthrough. We believe this is the future of many use cases and applications, enabling new and exciting opportunities given the combination of transparent and secured shared information, and economic incentives between users and developers. Ben Horowitz described it recently as a new computing platform that has the one new feature of “Trust”. We also see many super talented individuals and teams starting or joining early stage ventures in the blockchain space. Venture capital is ultimately about backing talent in fields that can disrupt existing solutions and create great value. Clearly, the market is extremely volatile and probably will be for some time as we are very early in the blockchain cycle. Investors are still working out what the right thesis is for investing capital, and sophisticated investors are testing the waters carefully, while learning the space and trying a few limited investments. Usually when I try to explain venture capital (which is a private market), I use the public markets as a first step of comparison. In the 2 by 2 chart below we will go through the public / private dimension, and I also added the single / multiple asset layer. This is a simplistic view of what are the investment options in front of current institutional investors. The names inside the chart are examples of these options, those in parenthesis refer to these options in the blockchain / crypto space. Public investment is by design an investment that is available for the public. Any individual with a brokerage account and few thousand dollars can buy a share in a public company. However, only few have access to private markets, those are “Accredited Investors”. This axis demonstrates the distinction between one who chooses to pick their own portfolio of assets and one who chooses to “outsource” the asset picking to a specialized firm. Invest in public markets doing your own picking — buy shares of Amazon (AMZN). The Crypto market analogy is buying Ether (ETH) which is the traded cryptocurrency that runs on top of the Ethereum blockchain (bottom left). Invest in public markets through fund managers — invest capital in a mutual fund or an ETF that is run by Fidelity. The Crypto analogy is investing in a fund that invests in crypto currencies such as Polychain (bottom right). Invest in private companies — buy a stake in Uber. The Crypto analogy is buying a stake (ie. equity) in Coinbase or Ripple for example (top left). Invest in private companies through fund managers — allocate capital to venture capital funds such as Sequoia. 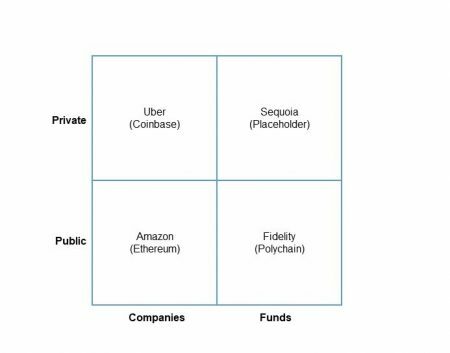 The Crypto analogy is investing in a dedicated fund that invest only in blockchain startups such as Placeholder that typically invest in these ventures before they have a tradable token (top right). At Vintage we’ve been discussing how to approach this nascent space of blockchain/crypto and will probably continue to debate over the next few years. In the next post, we’ll cover some trends that we see in this market in terms of investments, and how we currently approach this market. There is no doubt both our decision and the institutional investment market trends in general will continue to evolve rapidly in the near future. 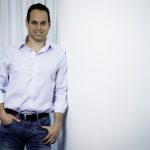 Diving Into Your Track Record – So…You Want to Raise A VC Fund?